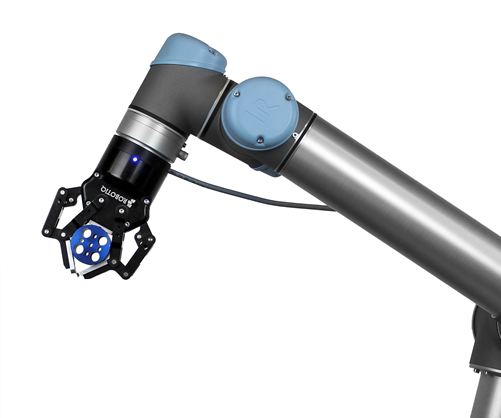 Robotiq (Canada) - Robotiq releases a new version of the 2-Finger 85 Adaptive Gripper. Twice as strong and 50% faster than its already successful predecessor, this new Gripper has been designed for robots having a payload of between 5 to 10 kg that are used in high-mix applications. Compatible with all major industrial and collaborative robot manufacturers, the 2-Finger 85 Adaptive Gripper provides flexibility to robots by being able to handle a wide variety of part shapes with its different gripping modes. With the ability to control the force exerted by its fingers, the user has the freedom to pick up fragile and brittle parts, as well as rugged parts. With the same 0 to 85 mm opening range, this new Gripper is now stronger and faster than ever. In fact, with a grip force from 60 to 200N, the maximum payload is thereby raised to 5 kg. At only 850g, this Gripper has a great payload to weight ratio. The new released version can also accommodate higher speeds that can be adjusted from between 20 to 150 mm/s. This means it can be set to execute really fast applications or to work with human coworkers within its lower speed range. The 2-Finger 85 Adaptive Gripper has been designed to be the best Gripper for Universal Robots in terms of payload (11lbs), flexibility and user-friendliness. It has also been designed to make the installation and programming on Universal Robots easy and accessible to everyone. From screws, mechanical coupling and software drivers, Robotiq provides everything you need for a quick installation. Robotiq drivers for the UR models have been developed to install automatically, simply by inserting a USB stick into the teach pendant. If you prefer a visual approach, installation videos are provided to customers that also help to make installation simpler. Included in the bundle are a series of Robotiq Gripper templates for Universal Robots. From now on the user only needs to import the Gripper programming template and then add it to the robot orders to setup the robotic application. “We have redesigned the 2-Finger Adaptive Gripper to let people take full advantage of robotics. With this new product and its featured bundle for Universal Robots, we want to make robotics accessible to everyone by being more intuitive and user-friendly”, says Samuel Bouchard, President of Robotiq. By introducing this product, Robotiq offers to every company, from SMEs to large manufacturers to research divisions, the possibility of having a flexible and user-friendly Robot Gripper.